We achieve surgical transformation without the surgery. 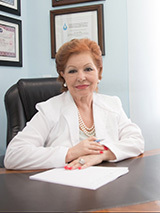 Dr. Leda Di Meco is the President of Weston Hcg Center . She earned her degree in Biology from the University of Rome, Italy. She has been in an academic career most of her life. Our full day medical spa will make you stress fade away into a distant memory. Our friendly, professional staff will pamper you; renew your mind, body and soul. Indulge yourself with one of our packages and experience a specialized combination of treatments that will transform your body and spirit. We offer the latest medical technologies with latest FDA approved equipment to improve and maintain the beauty of your skin. Our staff consists of medical aestheticians, licensed therapists, all within the supervision of a medical director for your safety. Begin your experience with a complimentary consultation where we create a customized treatment plan unique to you. We strongly believe that a beautiful environment can help you relax and make your health care experience less stressful. "My experience at Westong HCG center has been amazing. The staff and Dr. DiMeco are all wonderful and so attentive and supportive. I have lost 20 pounds in a month and I feel great about myself. They have been dedicated and motivated me along each step."